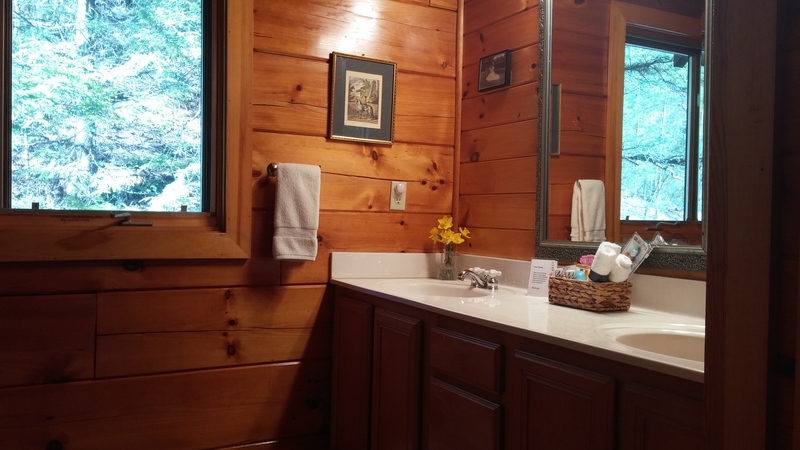 Enjoy the warmth and restorative simplicity of true log cabin living while pampering the body with organic toiletries and luxurious bath and bed linens. 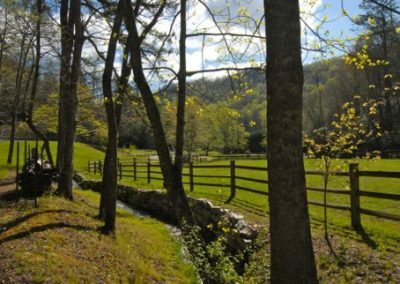 The sound of the waterfall, the ducks milling about on the ponds, and the quiet rhythm of life on the farm is wonderful for relaxing the mind and body. 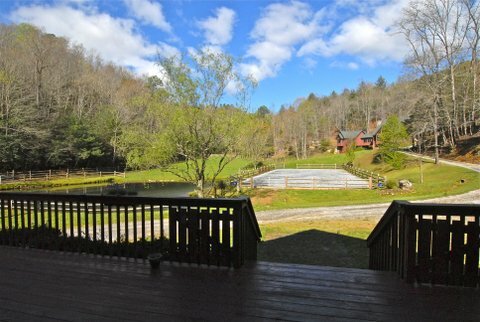 Located just 10 miles west of Brevard, North Carolina, this beautiful log cabin is part of a private equestrian estate that is nestled in its own secluded valley. Large picture windows frame meticulously maintained pastures bordered by streams and springs that flow into a pond located directly in front of the cabin. 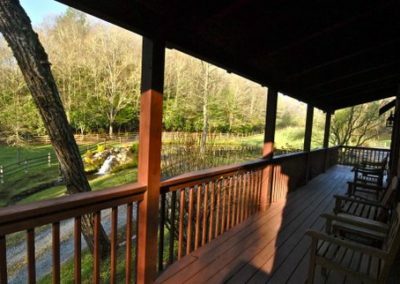 The covered porch overlooks a waterfall that is beautiful to look at and soothing to hear, especially as one drifts off to sleep. 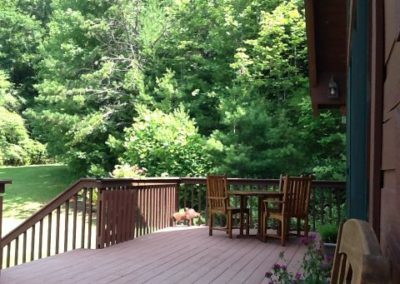 Come morning, enjoy a cup of coffee while watching the horses graze and the ducks dabble for their breakfast on the pond. 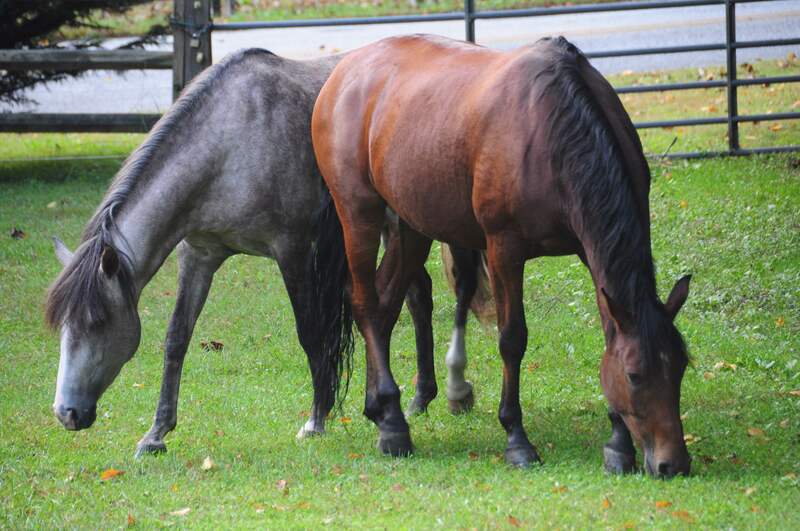 Guests are welcome to walk the property and under the owner’s supervision, meet the horses. 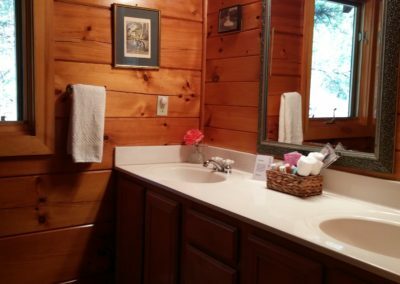 The master suite has a king size bed, private bath, and walk in closet. 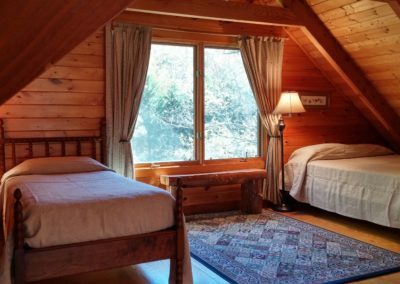 For those people who prefer to sleep with the windows open, the soothing sound of the water is particularly nice in this suite. Upstairs is a roomy loft area with another full bath, a queen bed, and two single beds. One of the single beds can be collapsed and moved out of the way if not needed. 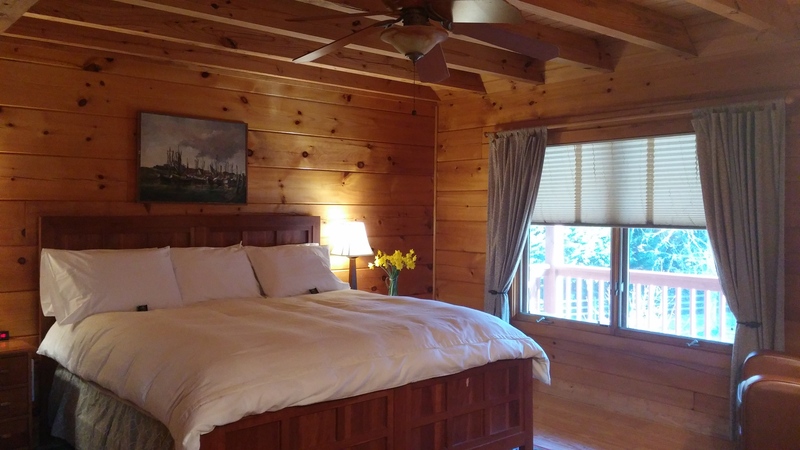 The cabin is air conditioned and separate temperature controls for the master bedroom, loft, and great room ensure maximum comfort during the summer months. 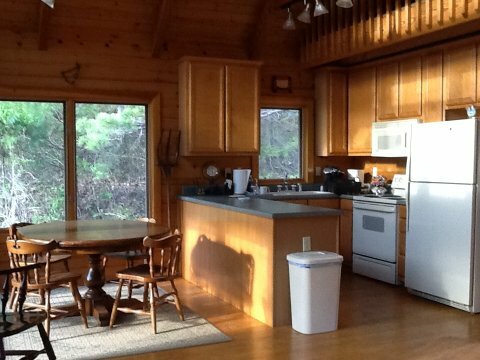 The cabin has an open floor plan for the kitchen, dining, and living room area. This design feature takes full advantage of the floor-to-ceiling windows to offer unrestricted views and a feeling of connection with the land and life that surround the cabin. 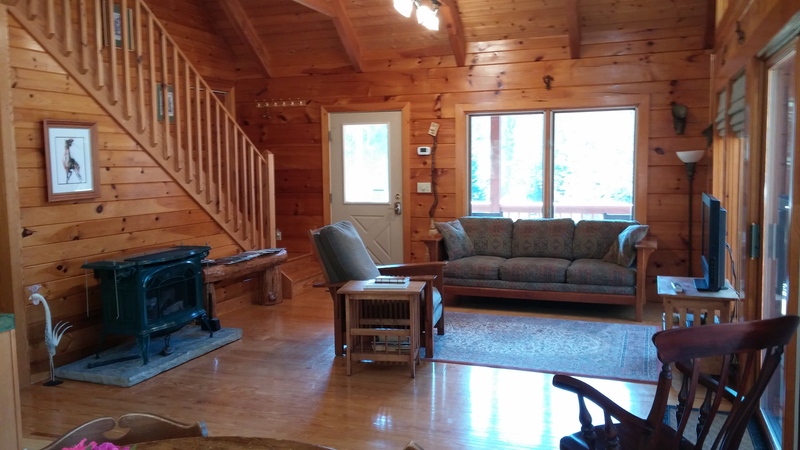 The living room is tastefully furnished with a couch and matching recliner as well as a rocking chair. 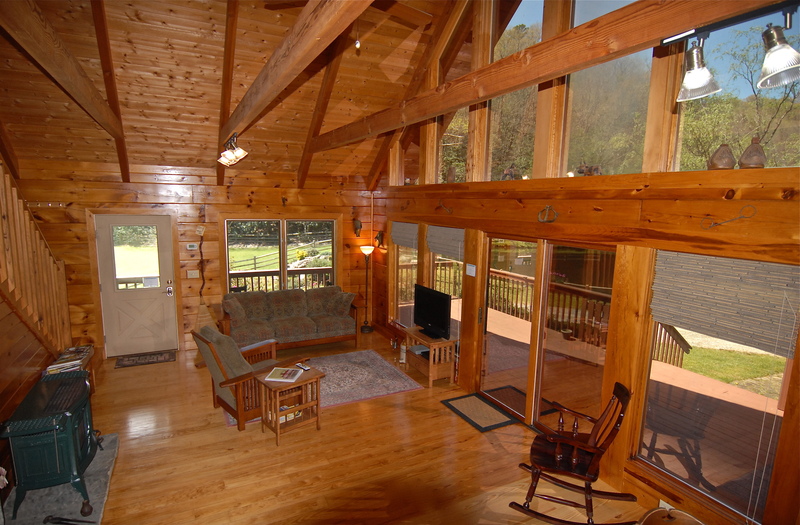 In addition, there is a flat screen television with Direct TV satellite and a DVD player. 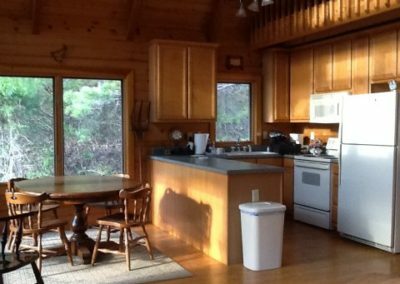 The kitchen is equipped with a microwave, electric range, refrigerator with an ice maker, toaster, dishwasher, blender, and coffee makers. There is also a stacked washer and dryer unit just off of the kitchen area. 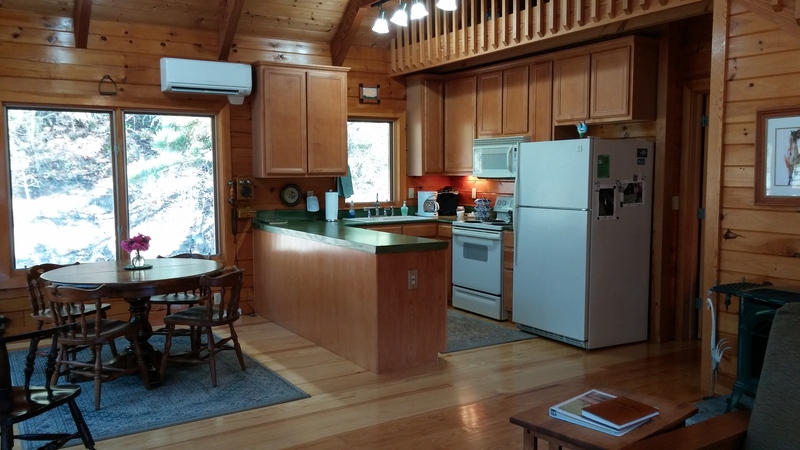 Additionally, there is gas grill and outside dining area located behind the cabin in its private yard. 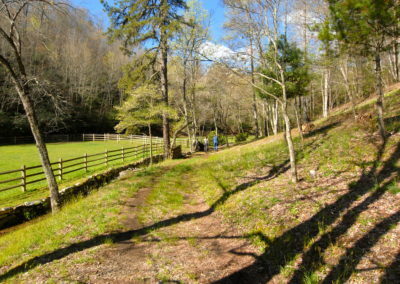 Access to the property is private, entry is via an electric gate. Guests are assigned a unique entry code prior to their arrival. Transylvania county is the land of waterfalls and hiking, biking, cycling, and sightseeing destinations are only minutes away. 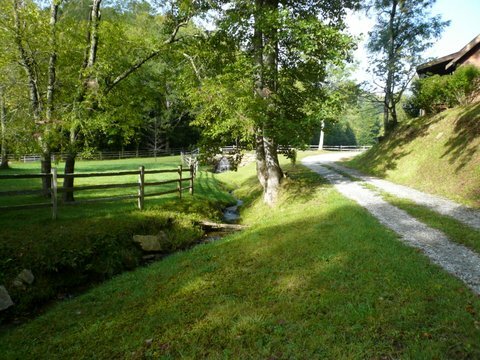 For hikers and mountain bikers, Jocassee State Park is just 2.3 miles down the road and for cyclists there are miles of bike routes all through the county. Should fly fishing, tubing, or kayaking interest you, the Davidson and French Broad Rivers are minutes away. 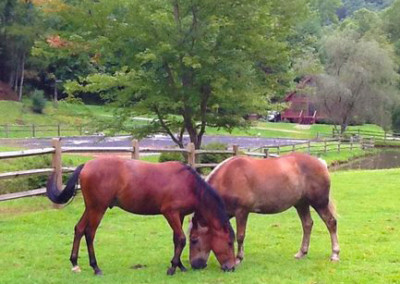 For the horse enthusiast, there are several stables in the area that offer trail rides, but reservations are a must. 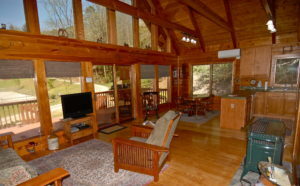 We are also close to DuPont State Forest, Pisgah State Forest, and Caesar’s Head State Park. The Biltmore Estate, with its winery, grounds, and gardens, is 35 miles to the north. 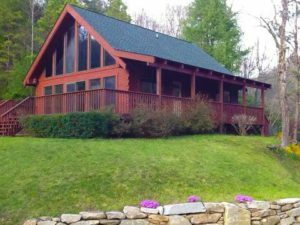 Located a mile off of Hwy 64, we are convenient to Sapphire, Cashiers, and Highlands to the west, Brevard and Hendersonville to the east, Asheville to the north, and the upstate of South Carolina to the south. All of these locations have much to offer from great restaurants to great antiquing. The major hubs of Atlanta to the south and Charlotte to the east are both only 2.5 hours away. 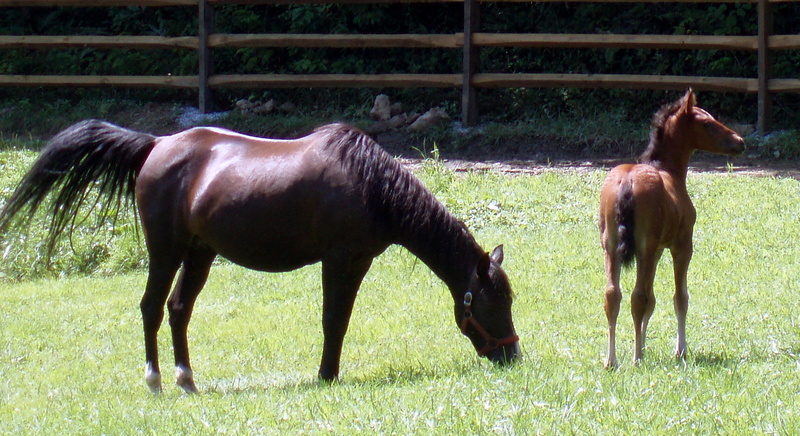 Guests are welcome to walk the property, feed the ducks, and meet the horses, (under the owner’s supervision). I love that we are located in a rural area but are still so close to to everything. Hiking, cycling, biking, fly fishing, fishing, riding, tubing, sightseeing, shopping, and antiquing are all within a 15 to 20 minute drive or less. The major hubs of Atlanta and Charlotte are both only a two and half hours away by car. Asheville Regional Airport is 45 minutes away. Having a car is essential in this area. 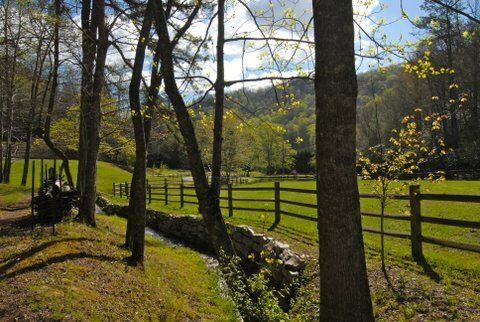 I live on the property and am available 24/7 to address any issues that may arise. We want our guests to be comfortable and have a good time. Let us know if we can help or answer questions. Because of the numerous water features and four legged creatures already on the property, we are unable to accommodate children or pets. 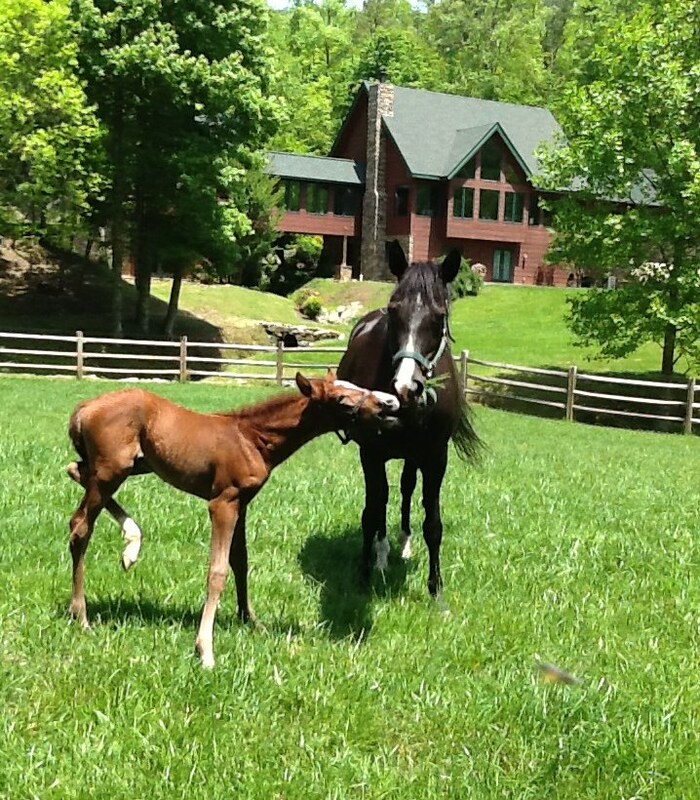 But if you are looking for a place geared towards the adult traveler, Falling Water Farm is for you. Better than a five star hotel! 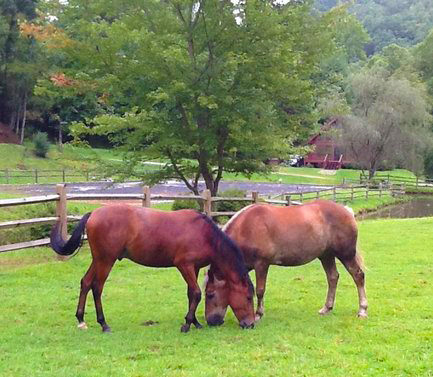 Our stay at Falling Waters farm was an amazing experience. The cabin was immaculate and well maintained. Ilse’s meticulous attention to every aspect of making her guests feel welcome and comfortable was above and beyond anything we could have imagined. Everything that you could possibly need was provided, including fresh-baked cookies and scones…which were delicious! 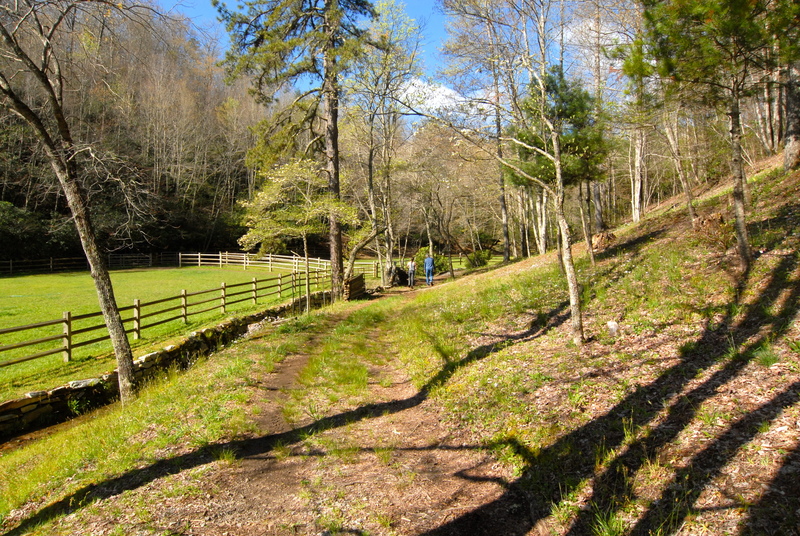 The property was amazingly landscaped with babbling brooks flowing down from the mountain to a lake complete with ducks and a goose. 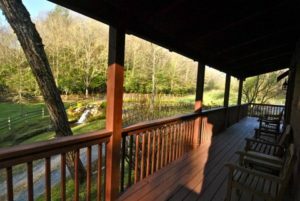 The lake emptied into a waterfall in front of the cabin that provided a relaxing view and sound while sitting on the front porch. 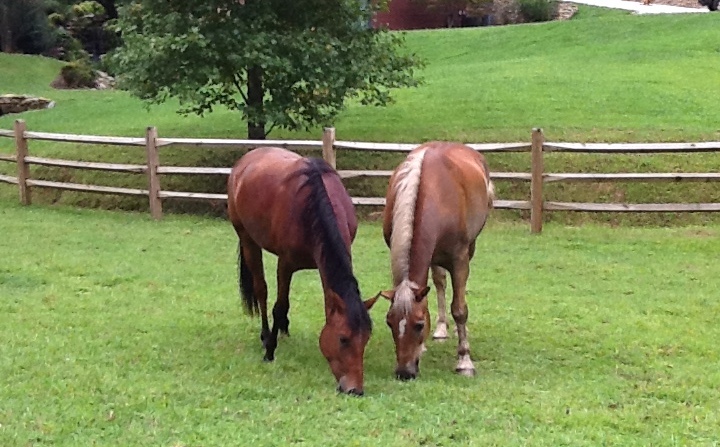 We also enjoyed watching the horses each morning in the pastures as they ate and played. 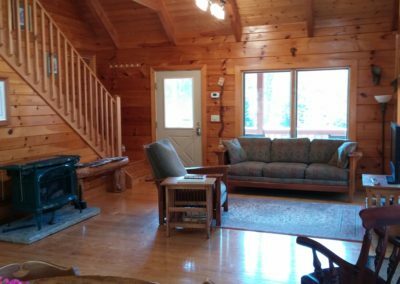 We will definitely return for another stay at Falling Water Farms, hopefully this fall to see the leaves and visit more waterfalls. Ilse has a very special place that she works very hard to maintain, as we observed, and we hope that she continues to make it available so that other vacationers can experience what we did. 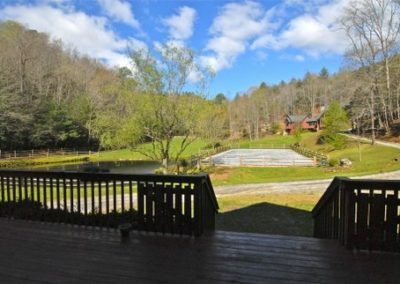 I can't imagine a better place to spend a peak Fall weekend in Western NC! 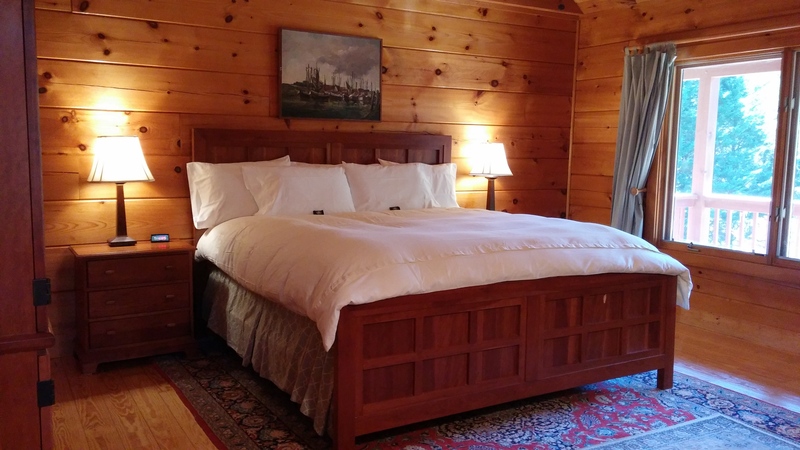 Everything about our stay at Falling Water Farm was perfect. The leaves were at their peak Fall color and the cabin is situated in an idyllic setting that truly represents the beauty of Western North Carolina and specifically Transylvania County. The area is known as the "Land of Waterfalls" and Falling Water Farm is located just outside of Brevard, NC which makes it a perfect place from which to launch your sightseeing excursions. 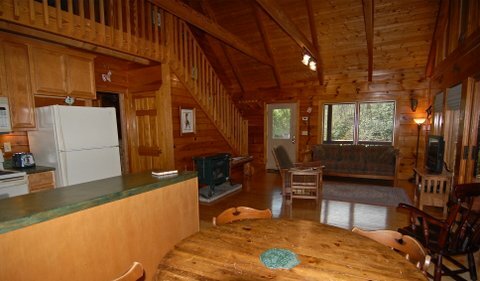 The cabin is beautifully furnished in a rustic decor and is absolutely immaculate. Ilse, the owner, is a gracious hostess who understands the meaning of hospitality. We are looking forward to visiting her again next year as another beautiful Fall season approaches. 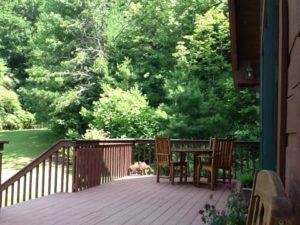 Our stay was one of the most restful, relaxing stays we've ever had at any location. Ilse goes out of her way to make sure everyone is welcome and that there isn't anything else a guest could possibly want or need. The cabin is the perfect size and beyond homey and the property is gorgeous. The attention to detail is amazing from power strips next to the beds to the highest quality linens and towels. Our stay at Falling Waters Farm was one of our most relaxing and comfortable vacations. 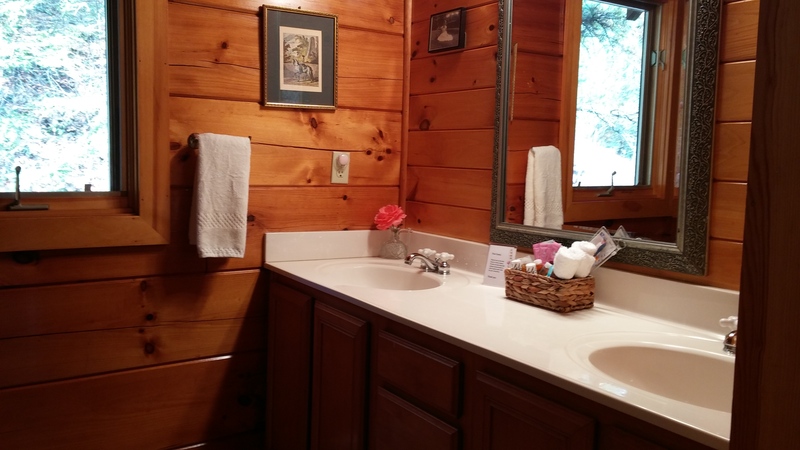 The cabin is equipped with everything you need, tastefully decorated, and very comfortable. Steve & Cindy D.
To make a reservation, simply choose one of the booking sites shown below and follow their instructions for making a reservation. Both sites will show you all costs involved before you book. 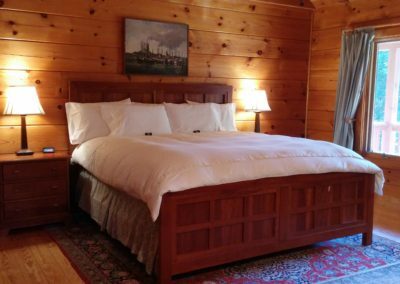 While Falling Water Farm's rates are consistent from site to site, there may be some variation in the booking/service fee. By all means feel free to compare these fees and choose the best value. Your online security is of utmost importance to us. Using these world renowned reservation/booking sites helps ensure that your online privacy and financial transactions are secure. To make a reservation, click on the booking site shown below and follow their instructions for making a reservation. All costs involved are clearly displayed before you book. Your online security is of utmost importance to us. Using this world renowned reservation/booking site helps ensure that your online privacy and financial transactions are secure. VRBO is part of a worldwide family of companies dedicated to the online property rental business. 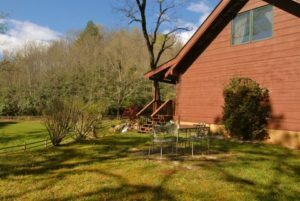 It is Falling Water Farm's preferred booking site because it allows the guest access to our contact information, (email & phone number). 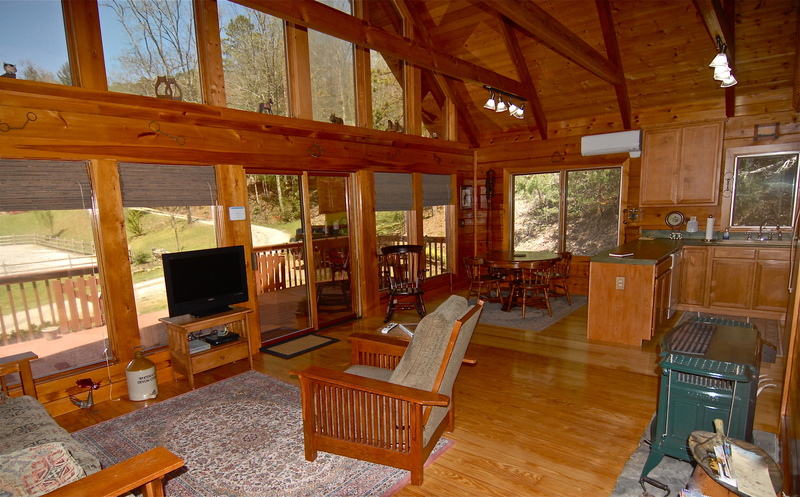 Airbnb is a premier booking site for vacation rental properties worldwide. 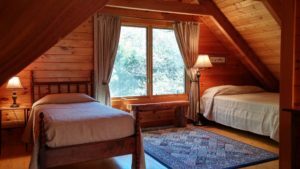 Airbnb is unique in that it features properties that allow guests to book just a room, as well as properties that follow the more traditional vacation rental model where the entire home is booked. Contact information is limited to phone numbers, available only after a property is booked, and email, using temporary email addresses assigned by Airbnb. Actual email addresses are never disclosed, even after the property has been booked. VRBO is part of a worldwide family of companies dedicated to the online property rental business. It is Falling Water Farm's preferred booking site because it allows the guest access to our contact information, (email & phone). Advertised rates are based on a three person occupancy. Additional guests are charges $65/night per extra guest. Advertised rates are based on a three person occupancy. Additional guests are charged $65/night per extra guest.